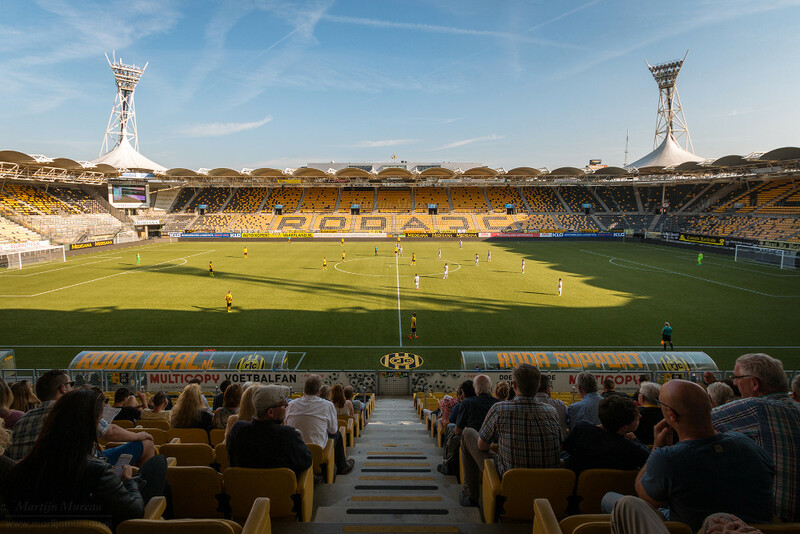 Parkstad Limburg Stadion was built in the late 1990s to provide Roda JC with a modern home. It replaced their old Kaalheide ground. The stadium officially opened on 15 August 2000 with a friendly between Roda JC and Real Zaragoza (2-2). It got named after the region it is located in since both the cities of Kerkrade and Heerlen contributed to the funding of the stadium. Parkstad Limburg Stadion houses various large retail stores as well as a hotel. Parkstad Limburg Stadion is located on the eastern edge of the city of Kerkrade, which at the same time is the southern edge of the (larger) city of Heerlen. 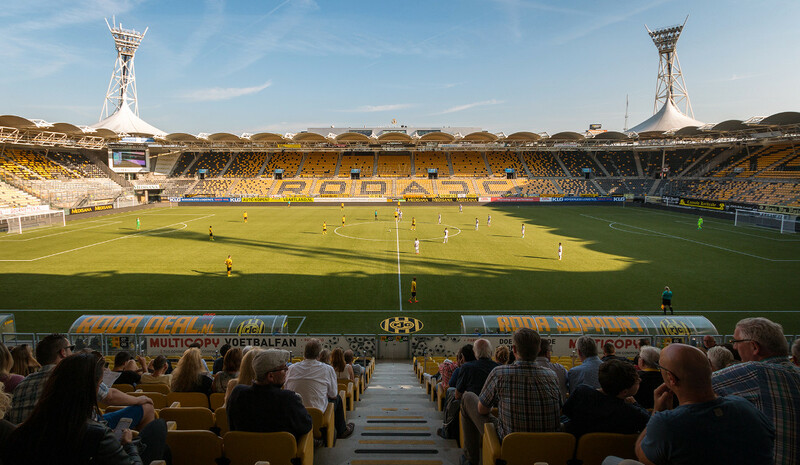 The stadium is located right next to the N281 motorway, that connects with motorways from Maastricht, Germany, Belgium, and the rest of Netherlands, so it is very easy to reach by car. There is furthermore plenty of parking right next to and near to the stadium. Getting to the Parkstad Limburg Stadion by public transport isn’t too hard either since various bus routes pass the stadium. Coming from either the rest of the Netherlands or Maastricht by train, it is quicker to travel through Heerlen than through Kerkrade city centre. From Heerlen train station, take either bus 20, 21, 26, 40, or 44. Bus 20 and 21 are the quickest, they get you to the stadium in 15 minutes, the other three need 5 minutes more. Get off at stop Parkstad Stadion. Bus 44 runs all the way through to the German city of Aachen so naturally if you’re coming from there, bus 44 can take you to the stadium. The same is true for bus 20 and the city of Kerkrade. Bus 20 takes about 20 minutes to get you to the stadium from Kerkrade Centrum train station. Roda JC tickets can be bought online, or at the Roda JC fanshop at the Parkstad Limburg Stadion. Roda may at times require possession of a Roda Club Card in order to be able to buy tickets. If tickets are still available, these can also be bought on the day of the match, however this is not possible for the three top matches against Ajax, Feyenoord, and PSV and other matches that require a club card. Overall, Roda rarely sell out, including for high-profile matches. Tickets cost either €17.50 for a seat behind the goal or €25.00 for a seat at the long side. Prices are increased with €2.50 for the three top matches. Rodajc.nl – Official website of Roda JC. Vvvlimburg.nl – Tourist information for the south of the Limburg province. 9292.nl – Bus journey planner.